Supersymmetry: A symmetry principle that relates the properties of particles with a whole number spin (bosons) to those with fractional spin (fermions). In the Holon Theory, supersymmetry has to do with the correspondence between logic in the lock-key state and logic in the lock state. Symmetry: A property of a physical system that does not change when the system is transformed in some manner. For example, a sphere is symmetrical under rotation since its appearance does not change if it is rotated. Two examples are given below on the symmetries of acu-point networks and the atomic table. This first example continues the archetypal formulation (or Li-Logic) using the 36 hexagrams as discussed in Supersymmetry-Orbifold-I-Ching Logic in the definition given for “Strings”. 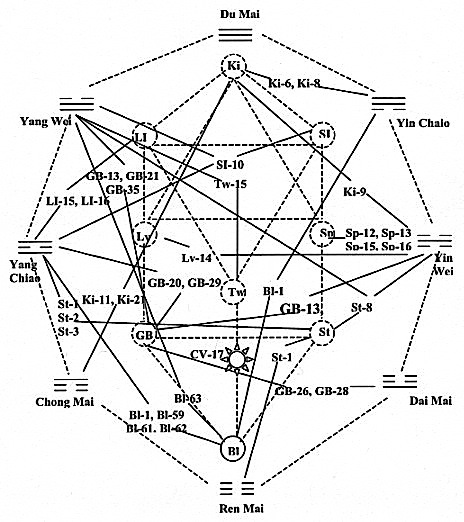 The Du Mai, Ren Mai, Chong Mai, Dai Mai, Yin Wei, Yang Wei, Yin Chiao, and Yang Chiao are the eight extra-meridians, while the organs are the 12 principle meridians. 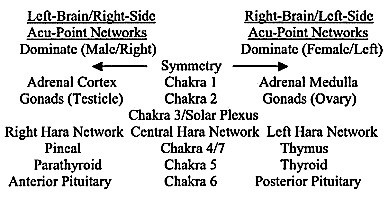 Interactions of the Holon of Chakras, neuro-endocrines, and acu-points are expressed in these eight extra-meridians. 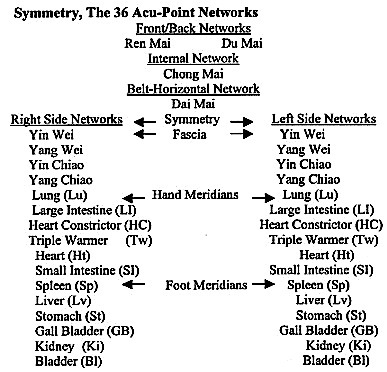 Remember, each of these extra-meridians contains their own networks of acu-points, which can be found in any acupuncture textbook. The interaction of these 36 networks is shown below. For correctness, the above diagram must be divided into two diagrams, one representing the left network and the other depicting the right network. CV-17 is a point in the Ren Mai network, which connects to HC, Lu, Ki, Sp, SI, Tw, and Ht. Notice that the inside of the above diagram depicts the Tree of Life, formed by the Star of David and the Cross, while the outside is the Octagon of the Tai Chi Diagram. 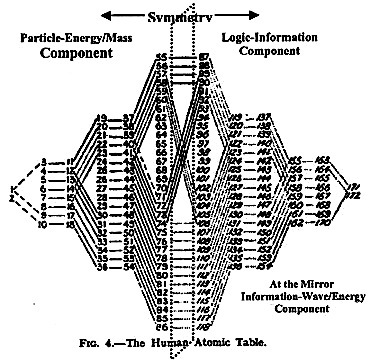 Symmetry, The Human Atomic Table: The human detection of left-right symmetry existing in all the atomic elements of the periodic table is illustrated below, and is taken from Guyon Richards’ book, The Chain of Life. When I had collected a great deal of data, and had worked out many series of elements with regard to the reflexes obtained from them, I was forced to put aside my research for professional work for some time. After a hard morning’s work I tried to switch off from everything connected with wireless reactions, and to rest my mind read an article on “Gothic Architecture” by Sydney Klein. The writer describes how cathedrals were built on the plan of the two triangles placed base to base. The two triangles together represented a fish, icqnz, symbol of the soul, and later of Jesus Christ, the Son of God. The chapter ended by saying that God is the Great Geometrist. With this thought in my mind I fell asleep, and on waking whilst I was still but half awake, I saw my [atomic] table of the two triangles, base to base, with the elements arranged within it. I was still, for a time, immersed in professional work, but about a week later, again in a semi-waking state, I saw my triangles base to base, containing all the elements, known and unknown, in their twelve periods. 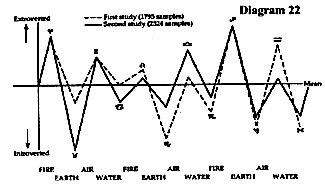 I then returned to my research and found that my collected data indicated the presence of 172 elements in the human body. This was in accordance with my table, complete and symmetrical. The question at once presents itself: Do the atoms with heavy nuclei exist in the earth? They must have done so once, or they would not exist in us. Perhaps they have broken down, as radium is now breaking down. This is however uncertain, for Dr. Petrie gives a 172 reaction for hydrogen, 171 for helium, 170 for lithium, 169 for beryllium, 168 for boron, and so on, and I have confirmed this on a number of elements. I think it is unlikely that hydrogen gas is combined with 172 in nature and I regard this as a peculiarity of the human reflexes. I think it is most likely that these two elements are tied closely together in the human body and that when the reflex on 1 ohm is exited by hydrogen this gas also stimulates the 172 mechanism. Similarly, lithium is tied to 170. This is a question, which may be settled in the future, but at any rate in man these frequencies have a very close connection. 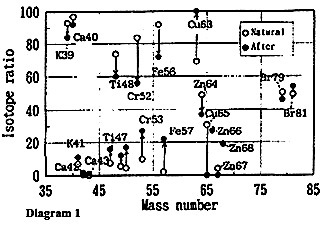 Shifts of isotopic distribution of reaction products as compared with natural isotopic distribution for mass numbers between 39 and 81. 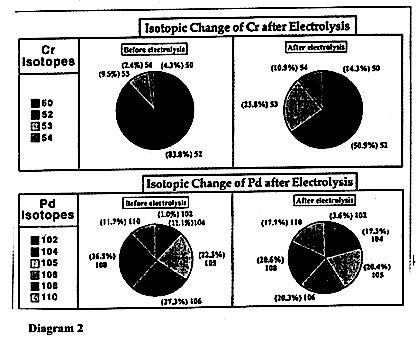 Symmetry, Acu-Points/Endocrines: The correspondences shown below can be mathematically formulated between acu-point networks and the logic-information component of the endocrine chemistry. Spirit Technology: Ability to decode the encoded logic inside the archetypal universe (or the Base 9 World), and hence obtain answers to a special set of unanswerable questions. This is a left-brain technology with a special set of learned knowledge. This is what I refer to as spirit-knowingness, in which all scientific breakthroughs corresponding to that particular branch of learned knowledge are made. On the other hand, Co-Creation technology involves the conservation of logic-information in matter or the integration of both left- and right-brain technologies. Soul Technology: Space-time technology of the matured right-brain. Space-time travel known as astroprojection, “seeing” or “experiencing” aura energy, levitation, and the activation of information-energy are examples of soul technology. In short, soul technology has to do with actualizing the information-energy through a singularity via teleportation at the Moment of Now. Soul technology corresponds to the conservation of information-energy in matter. Ancient Technology: Soul technology of right-brain maturity. This was the technology of an ancient civilization before the flood. The only remains of this technology are in the “out-of-place” artifacts found among the ruins of lost civilizations. Aspects of these technologies were described in the occult literature, the arts, the Bible, and the Eastern classics. From the perspective of the Holon Theory, this is a low-energy/high-information-dominated technology, which satisfies the conservations of information-energy via right- rather than left-brain understanding. An example of this technology is low frequency vibration such as as sound. This right-brain understanding also suggests that these are mind-technologies and that the technological devices found in the artifacts are perhaps mind operated. The conversion of information into energy also explains the accounts, in Hindu literature, of the detonation equivalent to the energy of an atomic bomb in 2400B.C. and other light generation devices found in the artifacts. (See Rene Noorbergen, Secrets of the Lost Races) It was this absence of left-brain understanding or the know-how that led to the destruction of their civilization. This destruction, or the Second Fall, was due to an extreme state of right-brain function in converting information into energy with no intellectual understanding about the use of energy. Likewise, today’s technology is in a state of extreme left-brain function in converting energy into a mass of destruction (rather than the conservation of logic-information for co-creation), which suggests that our civilization is in a state of technological destruction, or inside a Third Fall. This latter destruction corresponds to a minimal understanding of using co-created information technology, a technology of the soul. Notice that both Falls are due to our misunderstanding of the use of energy-dominated technologies together with our philosophy on the survival of the fittest. Survival of the fittest is the First Fall, due to body-brain maturity guided by only instinct without a mature mind. Teleportation: A spaceless-timeless transport of a subject into a state of singularity at the Moment of Now. Time: The state of Now in the state of a singularity. Time exists only as a teleportation operator in the form ict. History: The past. History is defined as the flow, or the memories, of completed activities from the very old to the very new. Finality: The future. The future represents the next final state. Thus, finality exists in a continuously changing state, which leads to the next finality and where each completed finality becomes a state of history. Now: The present, where time is created by a teleportation operator. One can never capture (or experience) the present, except in soul-time or spirit-time. Moment of Now: A moment of any event in event time is taken to be 10-43 seconds, which equals Planck’s time. Event Time: A block-time, which exists in a space-time continuum between a state defined as the initial conditions of this event and a potential state defined as the finality of this event. This measurement of the Now of an event whose entire script, from beginning to end, is played out in its entirety at this same Moment of Now represents an event-time. In other words, this Moment of the Now in event time is an instant of body time; yet this same Moment of Now in body time could be years or even centuries. Body Time: The script of a 3-dimensional event played out in a linear sequence, from beginning to end. A point in this linear sequence represents body time. Sun Time: The time indicated by the sun calendar. The importance of Sun Time, relative to body-mind/soul-spirit physiology, is its effects on the magnetic-photon-acu-point Holon. This Holon relationship is expressed in the Astrogenetics research of Maurice Cotterell, and summarized in The Mayan Prophecies as quoted below. 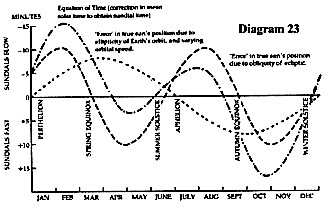 Astrogenetics–the scientific study of how astronomical forces influence biological rhythms and genetic factors–pulls together a number of scientifically established facts to prove that solar particles can affect the personalities of individual humans from the moment of conception [see Diagrams 21, 22, and 23]. Specifically, it has been discovered that changes in the weak magnetic field of the Earth cause genetic mutation in cells that are in the process of mitosis–a method of cell division that occurs at conception. 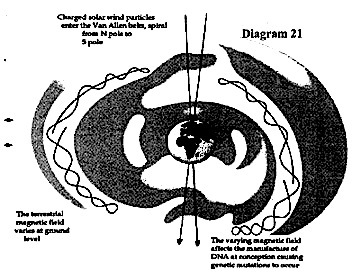 Experiments performed under the direction of Dr A R Lieboff of the Naval Research Institute, Bethesda, Maryland in 1984, on human cells called fibroblasts, showed that variations in environmental magnetic fields affected the synthesis of DNA in the cells. 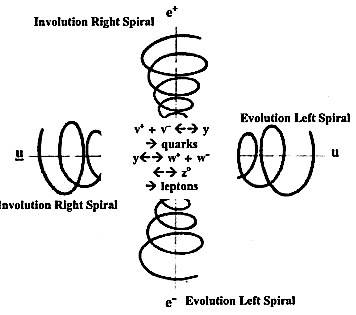 This means that the cells could undergo mutation when subjected to varying magnetic fields at strengths below that of the Earth’s own magnetic field. …Genetic change, as through mutation by variation of local magnetic field strength, may thus be responsible for unexpected personality traits. Or, to put it another way, your personality depends on the local magnetic field composition and strength at the moment of your conception. Moon Time: Marking of time according to a moon calendar. The following quotation from Moon Time by Johanna Paungger and Thomas Poppe shows the importance of the lunar cycles to body-mind/soul-spirit health and in everyday activities. … sun, moon and stars were transferred into the hands and face of celestial clock. The reasoning is quite plausible: if a particular impulse – say one that is favourable for gathering a medical herb, the treatment of a particular organ, and the storage of crops – lasts exactly two to three days each month and the moon in this period always passes across the same stars, then the idea naturally occurs deliberately to group these scattered stars together and give this ‘constellation’ a name that graphically describes the characteristics of the current influence. In addition to many other natural forces and laws, our forefathers isolated twelve impulses, each with a different nature and colouring, which recur in the course of the solar and the lunar cycles. To the constellations which the sun passes through (in the course of a year) and the moon passes through (in the course of a month) they gave twelve names: Aries, Taurus, Gemini, Cancer, Leo, Virgo, Libra, Scorpio, Sagittarius, Capricorn, Aquarius, and Pisces. The ancients, as described elsewhere, though possessing spirit-knowingness and soul perception, acquired the non-local knowledge and the space-time vision of the interconnectedness of these impulses. Furthermore, through these impulses and understandings, they possessed an intuitive knowledge of the conservation between logic and information and between information and energy. Through these understandings they created the numerous calendars for themselves, by means of which they could calculate what the future held in store in terms of favorable and restraining influences on their intentions. These sets of non-local logic-information can be viewed as the Holon interactions between the solar magnetic-neutrino influences with the lunar cycles, the phase changes of the moon. Remember, phase changes are related to encoding and decoding of the embedded logic-information, (See Phase Changes). That is, this influence can be accounted for in the Holon interactions of Sun/time-Moon/time-zodiac/information.